Once again, Big Green Smile has sent us a Method product to test, this time it’s Bathroom Flushable Wipes. I never thought I’d like these, well maybe I’d like them but they’re disposable so not very green right? Wrong. Okay it’s probably better to use a cloth but these are made from wood from renewable forests and can be flushed or even composted as there’s nothing bad in them. Basically for giving the bathroom a quick wipe rather than a proper clean, they come into their own when cleaning the toilet or the tiles around there. Smelling strongly of eucalyptus and mint (reminded me a drinking a mojito), they’re fine to use with a bare hand and are pretty wet. Almost too damp as squeezing them releases a bit of foam, but actually are the right side of moist and the resealable flap means they remain that way. Quick and easy can also mean green. I liked the convenience and ease of these and don’t get told off by the girlfriend for using the cloth meant for the kitchen floor for the toilet – hey, they were right next to each other. 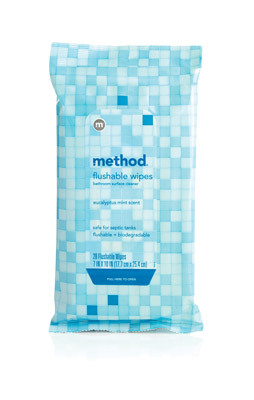 Method Bathroom Flushable Wipes cost £3.50 for 24 and are available from Big Green Smile. Check out our Eco Reviews pages for other Method product reviews.